Remedy Entertainment has a knack for creating memorable characters and gripping narratives, as the many fans of Max Payne and Alan Wake will easily attest to. 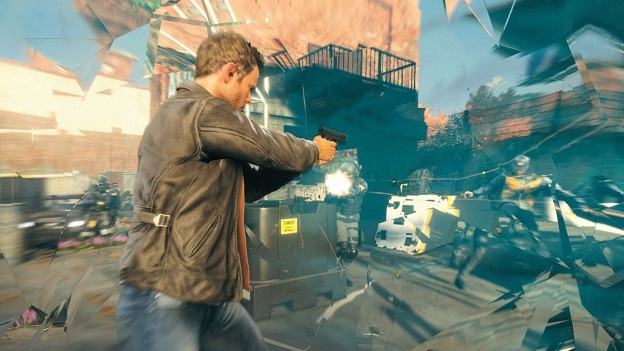 Quantum Break follows suit and expands its story into a live action medium. The script is solid and the performances well-delivered. 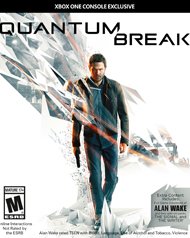 In fact, the narrative plays such a prominent role that it accentuates the lackluster gameplay - a third-person action shooter that has plenty of potential but falls into standard tropes with mediocre execution. It’s easy to imagine the design possibilities given the time-manipulating “super powers” thrust upon Jack Joyce, the protagonist cast into the role of hero trying to understand his mentally unstable physicist brother and the true motives behind an old friend’s call for help. After an experiment goes terribly awry, Joyce’s powers begin to manifest, granting him the ability to disrupt localized time fields. Dodging in a flash, slowing enemies to pepper them with ammo, creating a bullet stopping shield bubble, and launching enemies with a force blast are the handful of abilities that add flair to an otherwise generic shooter. Enemies are your standard make-up of corporate mercenaries, wielding shotguns, SMGs, rifles, and other common firearms, with an occasional soldier equipped with extra protection or time-distorting gear to copy your powers. The AI is aggressive, constantly trying to flank you, but isn't exceptionally challenging, even on harder difficulties. A flurry of time enhanced bullets or a few well-placed headshots are enough to handle every predictable wave of fresh mercs. Zipping between the hand placed cover spots and pelting enemies before they can blink noticeably tips the balance in your favor. Paired with speedy health regeneration, ammo replenishing backpacks sprinkled practically everywhere, and consequence-free deaths, it’s clear the focus was meant on keeping the story moving forward. 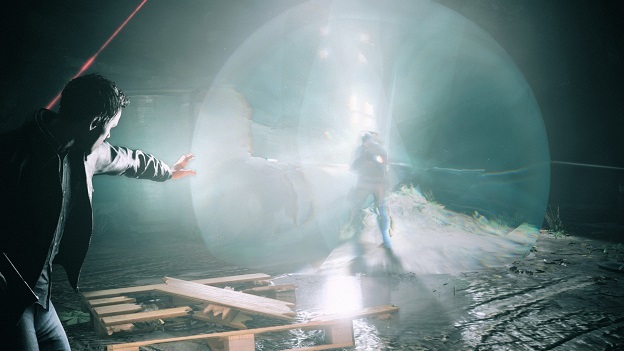 Unlike the perfect pacing in Alan Wake’s episodic structure, Quantum Break is as disjointed as the time stutters it portrays. You’ll be pinned down one moment by a dozen or so enemies in a courtyard or abandoned warehouse, then just when you begin to find a tactical rhythm the game pulls you out of combat to tackle a rudimentary puzzle involving the scripted use of Joyce’s powers, in which your hand is held most of the time through. Or you’ll spend far too much time sifting through a research area, perusing wordy documents and reading lengthy emails. Despite the oddity of accessing sensitive emails on random computers, the information grants you a great deal of insight on the supporting cast in the game. You could simply bypass these “collectible” pieces of lore to find some more action, but then you lose some of the backstory Remedy tries so hard to promote. It would be like fast forwarding though a movie scene or skipping a few pages in a book simply to find the part where bullets start flying again. If you relish discovering every piece of exposition and soaking in every cinematic cutscene, then Quantum Break has plenty to offer. The in-game cutscenes provide many dramatic breaks, but this production goes a giant step further with a full live-action show. At the end of each act, after you’ve made a crucial decision between two (somewhat) story altering choices, the game convinces you to grab some popcorn and a drink, and fluff up your cushion for the show. Each end of act scene runs roughly a half hour, piecing together a full-length movie when all is said and done. Joyce plays a relatively secondary role during these scenes, as they focus more on the internal affairs of Monarch corporation and revolve heavily on the calamity of time coming to an end. It may be a cast of relatively minor actors, but each does an absolutely fantastic job in their roles. Patrick Heusinger delivers the most ethical performance as Monarch’s head of security, struggling between his duties, the safety of his family, and the fate of the universe. Game of Thrones’s Aiden Gillen gives a solid portrayal of Joyce’s “friend” and main antagonist Paul Serene, but the Oscar goes to his right hand man Martin Hatch, played by Fringe’s Lance Reddick. Reddick masterfully shifts between motives with an almost unsettling poise, playing angles at every turn to further his personal ambitions and keep us guessing from start to finish.